Achieve more even air distribution and temperatures throughout your agricultural storerooms and boxes – while saving on energy costs too. Our positive ventilation systems also provide more even distribution of CIPC. Bradley Refrigeration can custom-design your positive ventilation system to fit your budget and other requirements. Equipment integrates with floor coolers and cross-ventilation systems. We can help you deliver better-quality produce. 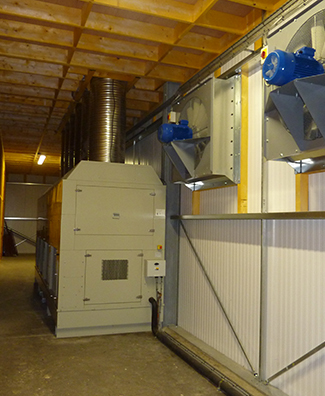 We design, supply, install and maintain positive ventilation systems for agricultural customers across the UK. Enjoy more even air and CIPC distribution. Ensure the same quantity of air through every storage box. And maintain an even temperature throughout your store. Our positive ventilation systems lead the way in energy efficiency. You could benefit from lower running costs, while also supporting your environmental policy. With complete control over your storage environments, you can achieve higher-quality produce. You can also reduce drying, curing and pull-down times. Bradley Refrigeration offers cost-effective maintenance plans and 24-hour repairs. So you can benefit from excellent reliability and minimum downtime. If you’re interested in a new positive ventilation system, talk to our team. We can offer expert advice and a free site survey, anywhere in the UK. Call us on 0114 236 9971 or email us.